It's gotten kinda cold here, finally. I mean it's December after all. I live on the coast of Virginia and we are fortunate to be in a zone 8 gardening area. But still, my tropicals and houseplants that have spent the summer outside must now come inside. They have been on the porch for the past few weeks, getting acclimated and hopefully shedding all the creepy crawlies they've been hosting all summer. So imagine my surprise when I went to cart them all into the coziness of my climate controlled interior that I discovered this. Can you see it? My aloe plant is getting ready to bloom again!! Shocking and Fabulous! Don’t you love the way plants surprise us! Love your blog! Wow! Mine is looking sad and woebegone from the cold. We’re also Zone 8. 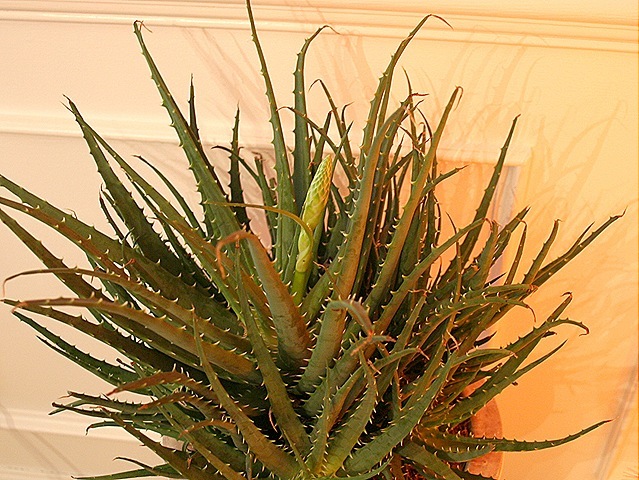 I did not even know you could get an aloe to bloom in a container! I know I do not have to convince you of how wonderful it is where you live. Up here in Wisconsin everything is frozen and dead. It is so nice to be able to “visit” your home where it is warm and lovely. Zone 8, you lucky gal! I did not know aloe bloomed!